The Music Hall in the Texas Pavilions is a huge auditorium comfortably seating an audience of 2, 600 people. During the the course of the show, the vast stage – 184 feet wide – holds 85 colorfully costumed singers and dancers, stunning scenery, and a movie screen upon which are flashed films from World War I, the Twenties, the Thirties, World War II, the Forties, the Fifties and Sixties to show us what was going on in the world at the time a certain show or song was popular. 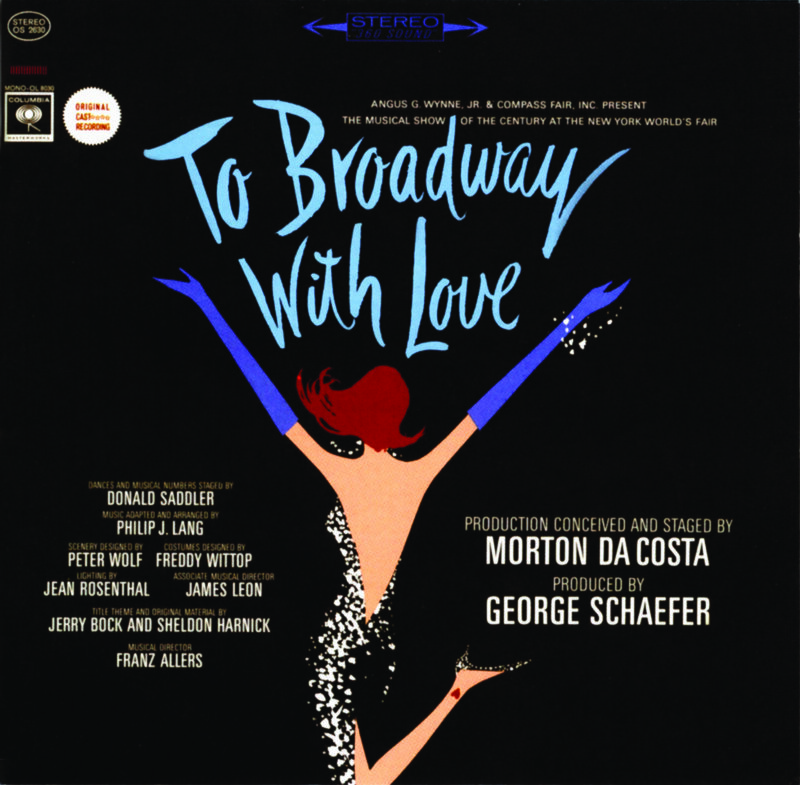 A lavish reminiscence of nearly a century of musical comedy, To Broadway with Love was conceived and directed by Morton Da Costa and produced by George Schaefer to remind us that although Broadway is but one of New York City’s main arteries, to most people it is the lifeline of theater, especially musical theater, in America. It is a musical bouquet to some of the song-and-dance men and women who over the years have delighted the nation and the world with words and music, romance, and laughter. The first half of this album of highlights from To Broadway with Love concentrates on the years from the early Minstrel Shows to the Ziegfeld era. The second half represents the shows of the Forties and modern times. Jerry Bock and Sheldon Harnick, composer and lyricist for To Broadway with Love, were most recently represented on Broadway with She Loves Me, winner of both the Variety poll and the Saturday Review critics’ poll for the best score of 1963. Earlier they had teamed up for Fiorello!, the first musical since I’d Rather Be Right to have an actual political figure as its leading character. It was also the third musical to be awarded the Pulitzer Prize for drama, an honor it shared with another Broadway show with a political subject, Of Thee I Sing. They wrote Tenderloin which starred Maurice Evans. Prior to their collaborations, Jerry Bock wrote the annual Haresfoot Show at the University of Wisconsin, and later provided the score for Mr. Wonderful, starring Sammy Davis, Jr. Sheldon Harnick, after studying music at Northwestern University, came to Broadway theatergoers’ attention with his “Boston Beguine,” a hit of New Faces of 1952. The following year Orson Bean sang his “Merry Minuet” (“They’re rioting in Africa …”) in John Murray Anderson’s Almanac. Bock and Harnick are currently working on the score for Fiddler on the Roof, a musical version of Sholom Aleichem’s Tevye’s Daughters, scheduled for Broadway. Carmen Alvarez Kelly Brown Miriam Burton Bob Carroll Bradford Craig Jean Deeks Ted Forlow Dorothy Frank Howard Hartmen Reby Howells Patti Karr Nancy Leighton Gloria LeRoy Don Liberto Rod Perry Jimmy Randolph Eddie Roll Stewart Rose Guy Rotondo Eileen Schauler Millie Slavin Sheila Smith Richard Tone The company was divided into two complete casts playing alternate days. When this recording was made, one cast was actually performing at the World’s Fair. When To Broadway with Love, the New York World’s Fair’s big, bright, bountiful musical extravaganza, opened at the Music Hall in the Texas Pavilions in April 1964, Manhattan’s newspaper critics were lavish in their praise. The New York Times called it “a swift, sentimental journey into the songs, dances, and moods of other days … a cheerful show.” Other reviewers variously described it as “expertly conceived,“ “beautifully staged … heavily populated with talent,” “the biggest eyeful and earful of stage memories you’re ever likely to meet,” and simply “a great show.” This song-filled album preserves – perhaps as a memento of your own visit to The Music Hall – highlights from this salute to Broadway’s musical theater.